Save your breath, please. You can keep running circles around the obvious until you’ve got roulette balls for brains, but the bottom line is if there were a sure-fire, bankable way to beat a roulette wheel, there’d be a lot more millionaire’s out there than there are now. Don’t get me wrong, though, I didn’t say you couldn’t make money in roulette, just that it wouldn’t be guaranteed. And you’d have to instill the typical gambling traits into yourself (patience, discipline, self control) if you want to be successful. First, realization. 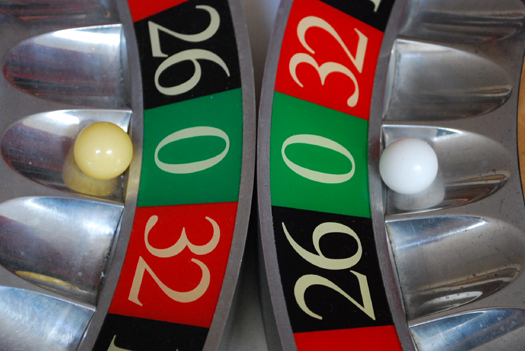 Roulette is a game that if you want to make big money, you have to put down big wagers. Bottom line. But what goes hand-in-hand with that is trusting yourself completely to be able to walk away after the FIRST time you pull a win from a single-number bet – assuming that puts or keeps you in the black. That’s the strategy, win big once and go home. Or at least go to the bar. Use progressive betting until you get that hit. Yes, you’ll need a sizable bankroll depending on how much you’re betting each time and how long you plan to wait until that hit comes. Now, I was lying a little when I said you have to go home after one hit. You don’t, but you’ll need to break and go to another table. On a separate note, since the wheels themselves are, in this modern day of technology, pretty air tight and unbiased, the only faltering variable you can use to spot “trends” at the wheel is the dealer. He or she will sometimes get into a short-term rhythm, something a player can spot, ride out and bet sections of the table to try to capitalize. Finally, I won’t get into roulette computers here in this article, but just know that they exists and is something else you can look into if you’re interested in gaining further potential advantages at the table. Online Casino Bonuses – What are they and what is preferable?